"I'm going to count to three. Then I'm going to make the coin move." You don't have to be Professor X to get a score of 20/20 in hindsight. Earlier I blogged about how I originally wasn't going to see this film but changed my mind with it's release. Thank God I did. The title is X-Men: First Class and it truly means it. Let me be clear; This is the best X-Men film yet. Starting with an exact X-Men recreation of Erik Lehnsherr's separation from his parents, where it's predecessor split to Jean Grey's senate sermon, this film stays on the ground and follows what plans the Nazi Sebastian Shaw has for a boy who can bend metal to his whim. 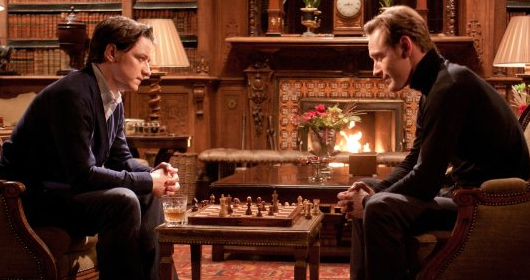 A 'young Charles Xavier uncovering another of his kind' flip forward in time and we find Sebastian a wanted man. Moira MacTaggert is on his trail and Erik is after his head. Safe inside the Hellfire Club however, Shaw is about to induce a Cold War catastrophe, in the hope obliterating mankind will prevent it doing such to mutants. As Moira and Erik's paths cross at Xavier, it is only through him and their collected first class of gifted teens, that world peace stands it's only chance. That is if Erik can put aside the fact he agrees more with Shaw's idealologies than his friends Charles' to achieve it. Like Sir Patrick Stewart and Sir Ian McKellen before them, the master-class of acting talent shown by James McAvoy's take on Charles Xavier and Michael Fassbender's Magneto anchor this film, giving the whole scenario it's believability. 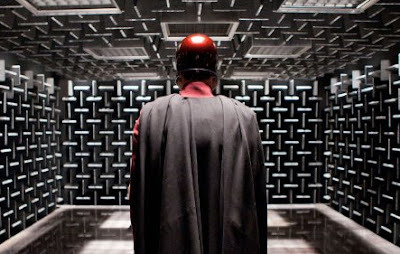 While Kevin Bacon's Shaw is powerful enough to stop the master of (audience) magnetism walking away with the show from a rouge's perspective, Fassbender is a strong case for a prequel to this prequel, simply titled: Magneto. The scene 'Magneto's beer with the tailor and pig farmer' my favourite of the film. "Frankentein's Monster" indeed. The ladies take point from here on down. Jennifer Lawrence serves as the films almost second plot base in the form (or is that forms?) of Mystique. Through her battle for acceptance in light of an actual physical mutation, we first see the differences between Charles and Erik, as well as uncharted territory between Raven and the Beast (Nicholas Hoult). Hank McCoy's blue furry self is better here then he was in X-Men 3, that's for sure. Speaking of visual awesomeness, I can't leave out a salute to the White Queen. Blurring some of the film's best lines and moments is Emma Frost. While the movement of her diamond form is in need of industry award, it's actress January Jones' own facial expressions and bang-on body language (sorry, my mind is running out of adjectives) that nail the arogance and altitude of Ms. Frost. With an ending that will leave you screaming for the sequel then and there, X-Men: First Class stomps all over Thor and Iron Man 2 like a Sentinel throwing a tantrum. The next stage in evolution for the X-Men franchise funnily enough - is right here at the start. WOW! Dan that's some real high praise especially what you said about how it compares to THOR. i can't wait to see it! I finally saw Thor this weekend and if this was better, I guess I'd better make date night this weekend a double-header. Mrs. D wants her pirates but I'm thinking we'll follow that one up with some First Class. Thanks for taking a chance and paving the way for the rest of us. I commented yesterday on your initial post about this. 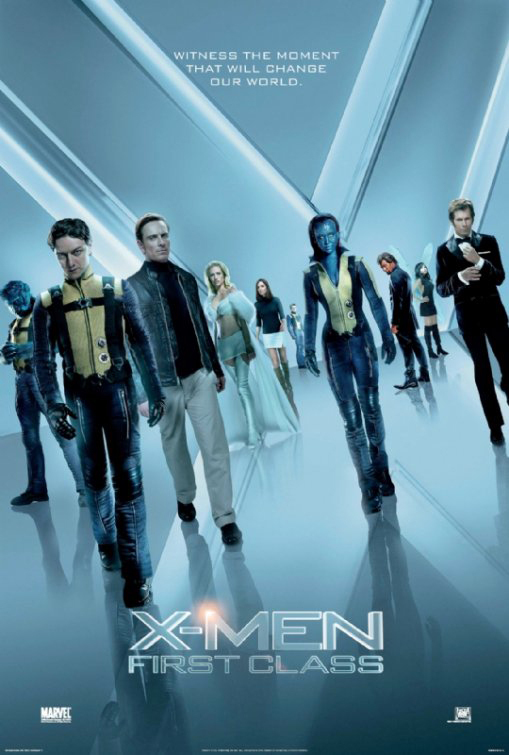 I think this was the best X-Men movie by far. There were several awesome scenes in the movie. Azazel's rain, Charles's ways with the ladies, Havok's brief but emotional bond with his teammates, etc. I could list a bunch of other scenes, but Vaughn did a fantastic job of giving the movie a lot of heart. My only disagreements with you are Jennifer Lawrence, and January Jones. JL did a decent job as Mystique, but it wasn't great the way that most people make it out to be. She delivered a couple of lines in near-cringe-worthy ways. JJ on the other hand, was flat out awful. She acts the same in every show/movie she's ever been in. It's like watching a mannequin. A hot mannequin I suppose. Who was the other returning star...? Did I miss something? I THINK I know who it is, but I don't know her face well enough to know if it's who I think it is or not. I wasn't expecting Wolvie in there, so it was a super awesome surprise for me. Oh, and I noticed a goof that I couldn't get out of my mind for 5 mins. When Mystique transformed into Shaw, she had the Magneto helmet on. Btw, if you haven't seen all of Vaughn's other directorial works, I'd highly recommend them all, especially Stardust. Thanks for all the great comments folks! David and Craig let me know what you thought! Ender, glad you liked the movie too. When it comes to Mystique I wasn't meaning so much that the role was the next best acted, I meant more that that character was down from the three leaders the one the story hung off most, and the one who gave the best insight into the mutant plight. Sorry for any misunderstanding there. I wasn't expecting Wolvie either but it actually made me laugh out loud, and showed great continuity to boot! Havok was interesting for me in that I've never thought of his powers as whips - still the coathanger suit would've been cool! And as anon pointed out the other cameo was Rebecca who played Mystique in the originals. I finally saw Thor last weekend too. Which was no fault of the cinemas, just a busy schedule. I also saw the trailer for this one, which I'm sure I'll love, but it will only be reliese on the 9TH of June. Well, I'm in vacations now. Maybe I'll see it on the first day. Went to see this one today. It was nicely writen and cameos of Rebeca Romjin and Hugh Jackman were interesting even for people who didn't ever read a comic, but whatched the other x-men movies. My husband spent the first part of the movie teasing that he liked the "other Mystic" better. I always liked James MacAvoy, and it was the first time I saw the new Magneto, but I was impressed. Only thing, I didn't like was Moira MacTagart as a CIA agent, with no welsh accent and no bangs. Actually in my opinion with no Moira MacTagart. She could as well not have been there, for most of the movie. Otherwise, nice script and nice cast. Thanks for those comments Aliera - glad you liked it so much! Yeah I have to admit I was sitting there saying the exact same thing about Mystique and then boom there the 'original' actress was! You make a good point bout Moira - I was worried they would drop the accent on Banshee too. Banshee and Beast were twoo of my favorite characters in the movie. I loved seeing Banshee flying while screaming.